Homemade Enchilada Sauce. A 15 minute, easy recipe that you can customize with spices. Tastes much better than store-bought cans. Naturally vegan and can be made gluten-free. Remember when I mentioned the first time I used avocado oil? Generally for something I haven’t made before that has a specific desired outcome (like enchilada sauce), I google several other recipes first. I look for common themes, general methods and ingredients before deciding whether to follow one recipe specifically or create my own version. You’ll usually know which way I went because I tend to talk about how a recipe came about, and always try to give credit to my sources. Enchilada sauce typically is made from either tomato paste, tomato sauce or crushed tomatoes (I chose the latter). Obviously all of these will yield different results. 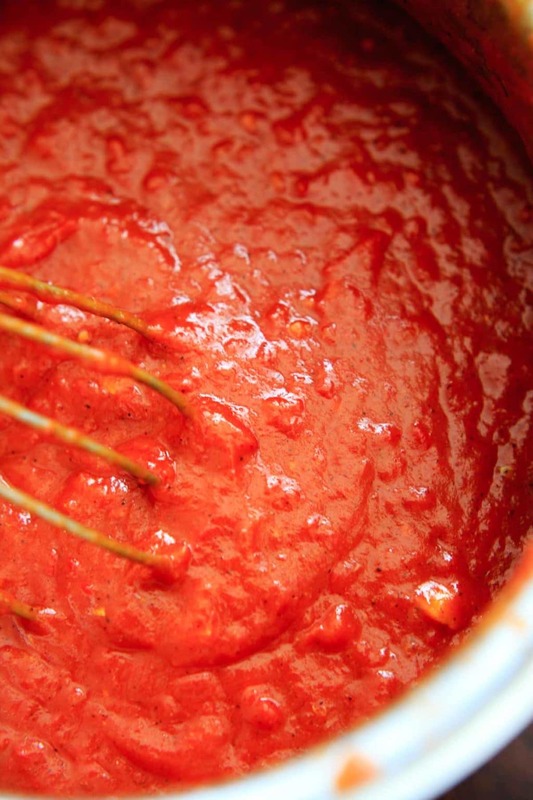 The more concentrated tomato product you choose, the thicker your enchilada sauce will be. 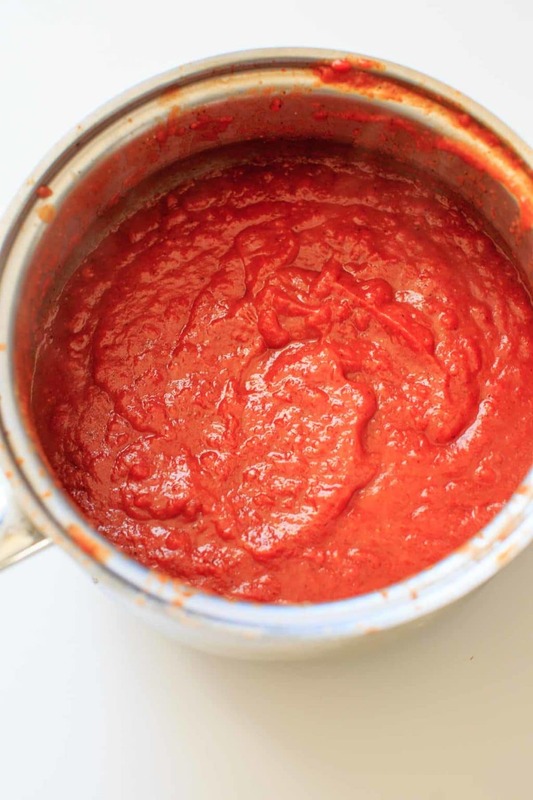 If you’re looking for a super thick version, you’ll want to look up a different recipe using tomato paste. There is even a kind that doesn’t use any tomato base at all. So there are dozens of versions. To start with, flour is usually added to vegetable oil, which I hardly use any more in my kitchen. I almost reached for the olive oil, when I saw the avocado oil I had purchased and never used sitting right next to it. Enchilada sauce is Mexican food. Avocados are Mexican food. Seemed like it should work! 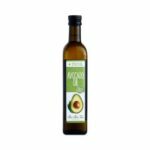 The truth of the matter is that it doesn’t really change the overall flavor, so you can use vegetable oil or olive oil if you don’t want to try avocado oil. But after reading about the health benefits you might want to. Either way, the one tip I have is to USE A POT WITH A LID. I forgot how messy cooking tomatoes can get the first time I made this, and ended up with tomato burns on my skin and splotches all over my stove. I’d show you the video but I’m too embarrassed of the mess. There’s really not much that’s interesting about photographing enchilada sauce. It looks very similar to homemade marinara sauce, which isn’t surprising since they are both made from crushed tomatoes. 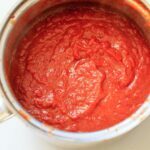 If you like a smoother consistency, you can puree the crushed tomatoes before adding to the pot or use an immersion blender afterwards. Spices used in this recipe are cumin, onion powder, garlic powder, cayenne pepper, and chili powder. How much chili powder you end up using will depend on not only your taste buds, but what type of chili powder you use. I had a kind that wasn’t spicy (which is why I added cayenne) but some types of chili powder have a kick. If your chili powder doesn’t have a high spice level, you might want to add more than what is listed in the recipe. Taste after simmering and add as necessary. Homemade Enchilada Sauce. A 10 minute, easy recipe that you can customize with spices. Tastes much better than store-bought cans. Naturally vegan and can be made gluten-free. In a medium sauce pan, heat oil over medium-high heat. Whisk in flour until combined. Add remaining ingredients (crushed tomatoes, broth, brown sugar and spices). Whisk together and cover. When it starts to boil, reduce heat to low and let simmer until thickened for about 10 minutes. Taste and add more salt or spice as needed. 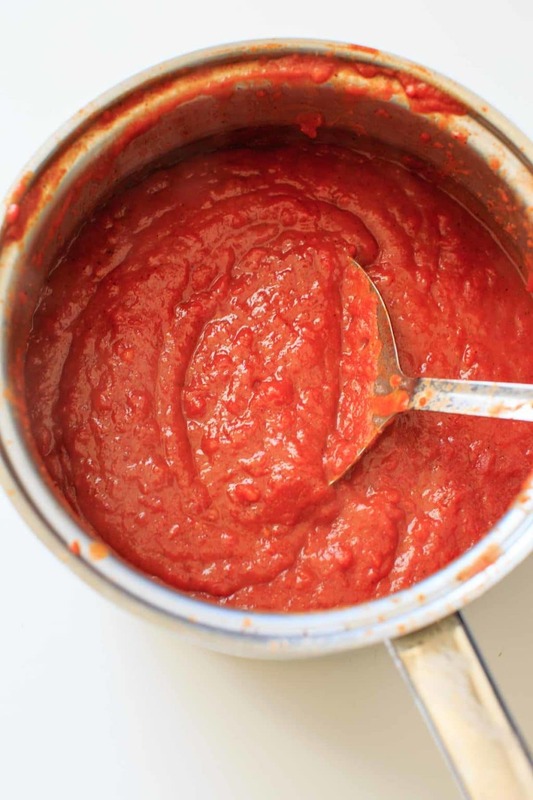 *If you want a smoother consistently, puree the crushed tomatoes or use an immersion blender. **Chili powder varies depending on the brand. I used a kind that was not spicy, which is why I added cayenne pepper. Depending on the spice level of yours, you may want to use more or less than the recommended tablespoon.